Updated Mar 16, 2019: Added Regex Filtering section. A collection of useful tidbits to make GTmetrix a little more convenient and/or useful. The GTmetrix Dashboard is the center of all your analysis activity. You can select desired Analysis Options and initiate new tests. All of your tests are shown in a table, with a summary of details displayed for at-a-glance reading. There are 3 main sections on the GTmetrix Dashboard: 1) Analyze and Analysis Options, 2) Report Table, 3) GTmetrix Usage and News/Updates. GTmetrix Dashboard split into 3 sections: 1) Analyze and Analysis Options, 2) Report Table, 3) GTmetrix Usage and News/Updates. In this guide, we’ll break everything down about the Dashboard so you can make the most of it. Here’s where you get started with your optimization journey. You can enter new URLs here for analysis, and select desired Analysis Options for a variety of test scenarios. Click “Analysis Options” to reveal additional test features. We’ve covered the basics of GTmetrix analysis in our Basic Analysis with GTmetrix article, so be sure to take a look. On the Dashboard, you can click on options on the status line to quickly cycle through them instead of having to expand the Analysis Options. With GTmetrix PRO and the Developer Toolkit, you can create presets of your Analysis Options for quick and convenient testing. Dashboard Analyze Button now has a dropdown for presets. After successful analysis, this is where all of your GTmetrix reports appear, in order of last report generated. The page has different options than the ones analyzed before. Entries in the report table show the latest report of the page analyzed. All tests initiated from the Dashboard and API appear in the Report Table. The best way to find and categorize your reports is by using the filtering options. You can do a quick filter by keyword using the field in the top right. Quickly filter out domains with keywords – “dev” in this example above. You can also do more advanced filtering by clicking More Filters and selecting the additional options you wish to filter your reports by. You can also sort by multiple filters. Pick the test region, monitoring status, browser and any other Analysis Options to easily find the reports you’re looking for. You can now filter your reports using regular expressions (regex). Type ! to enter regex mode. Type in ! to switch over to regex mode – you’ll notice the magnifying icon change over to a regex icon, indicating the mode switch. If a regex error is detected, the icon and input border will turn red. Want to learn how to use regular expressions? Have a look at RegexOne’s Interactive Tutorial. You’ll initially see 3 default filters set for you on your report table: All, Saved and Monitoring. Naturally, the Saved and Monitoring filters will show you which pages are Saved and Monitored respectively. You can edit or delete these two filters as you please. Saved and monitored tabs are editable and/or deletable! If you’ve created a filter that delivers your desired reports, you can save it as a tab for convenient access. After selecting your filters, click Save As on the bottom right corner. A Filter Name field will appear where you can rename the tab. Rename your filter tab to something useful. Click Save when you’re done and your tab will appear on your Dashboard. You can have up to three filter tabs on a Basic plan. Upgrade to PRO for unlimited filters. You can hover over the icons in the Options column for more details. You can click on the URL, Page Load, PageSpeed, YSlow and/or Last Report columns to sort reports by ascending or descending order. 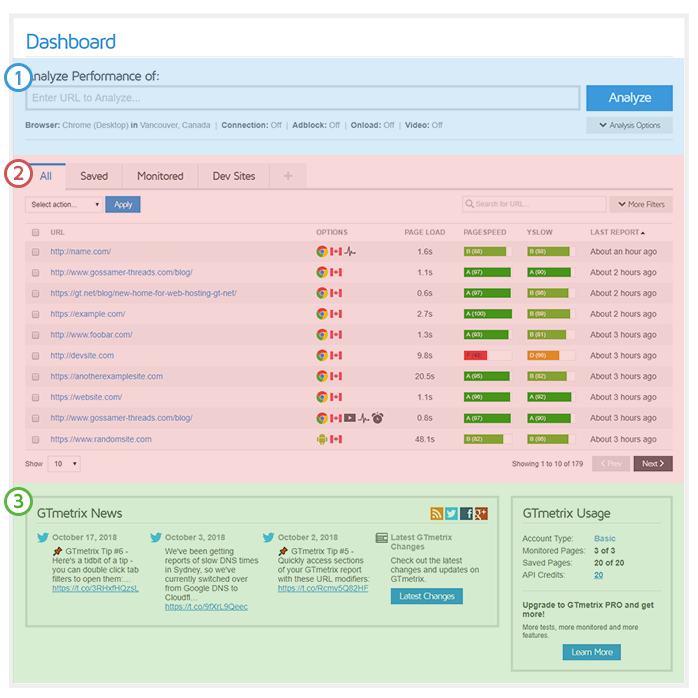 Re-sort rows by URL, Page Load Time, PageSpeed or YSlow Scores and Latest Report. Use this to find the pages with the slowest Page Load, or worst PageSpeed/YSlow scores, or to sort by name/last report date to find desired reports. You can show up to 100 reports on the Dashboard. Just select the amount you wish to view in the bottom left “Show” dropdown. Show up to 100 reports on your Dashboard. Perform bulk actions on the Dashboard. Report comparisons will use the latest reports generated from that page. Up to four reports can be compared. At the bottom you’ll see a feed for our GTmetrix Twitter account for news and updates – pretty standard really. You’ll also see your GTmetrix Usage, with amount of monitored/save URLs and API credits left. Your GTmetrix Usage details are located on the bottom right section. Of course, you can upgrade to PRO if you’ve reached the limits of your Basic account and need more. Get more monitoring slots and advanced options along with hourly testing with a GTmetrix PRO plan. Available in Bronze, Silver or Gold levels – or create a Custom plan to suit your needs! Other features include: Priority access in the queue, the Developer Toolkit bundle, Remote location monitoring, and much more!